This White Shepherd nicknamed Glafira/General sold and went to a new family. We are currently taking reservations for upcoming March 2018 litter. Litters typically sell out quickly. Our dogs are part of our family and every family member helps with the care of the dogs and puppies. We see our puppy parents are an extension of our family. 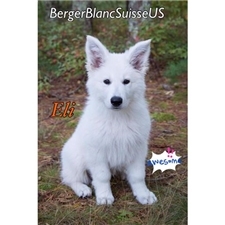 Please make sure you read our testimonials on our facebook page at https://www.facebook.com/bergerblancsuisseus This is an exceptional breeding sired with General who is an International Champion in five Countries. As you may or may not know, these puppies are very hard to find and are very rare. 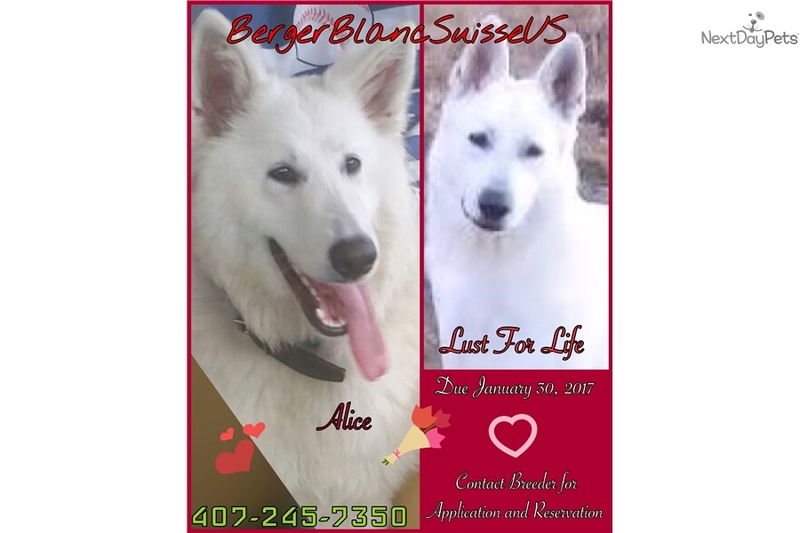 I am happy to be one of a very few breeders in the United States Offering a Breeding Program for the Berger Blanc Suisse AKA White Swiss Shepherd AKA Swiss White Shepherd. These ARE NOT WHITE German Shepherds. You can get a lot of information on our site at https://www.BergerBlancSuisse.US or feel free to call 407-245-7350. We are in Florida and we ship in the United States.